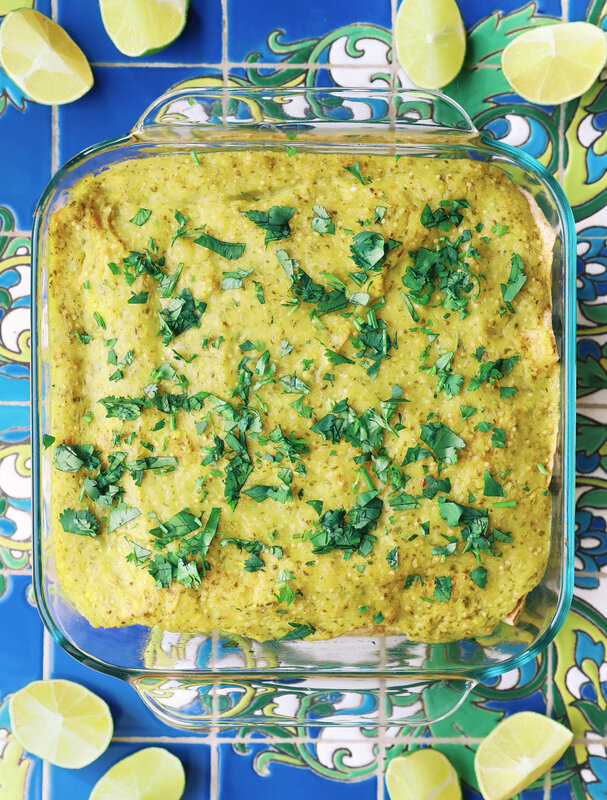 This mashed potato & sauerkraut casserole is one of my favorite vegan comfort food recipes. With a juicy layer of quality sauerkraut on the bottom, a layer of fluffy vegan-cheezy garlic mashed potatoes in the middle, and crispy herbed breadcrumbs on top, this sauerkraut packs in all of the best flavors and textures into one package. When I think of casseroles, I expect something that's going to require a lot of preparation, but this casserole is so simple! 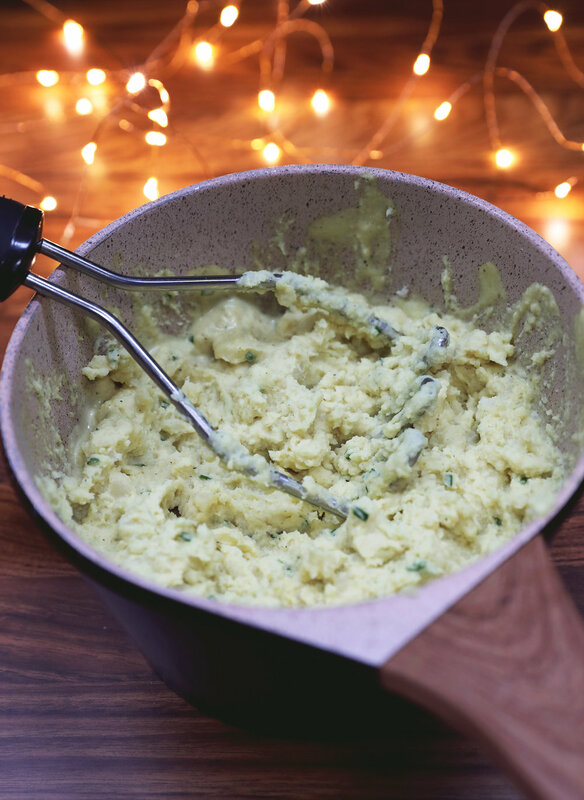 Especially if you don't enjoy chopping lots of different ingredients, because all you have to chop in this recipe is potatoes- and that's it! Mashed potatoes are actually really easy to make from scratch. I recommend russet potatoes because they are the best for mashing, once they're peeled, chopped and steamed, I mash them with a creamy garlic sauce that I whip up in the blender while the potatoes are boiling. Then I place a layer of sauerkraut in the bottom of a baking dish, top it with the mashed potatoes and sprinkle herbed breadcrumbs over the top. I've had this idea for a potato and sauerkraut casserole for a few months now, ever since I made a potato and sauerkraut soup recipe and became completely obsessed with the combination. 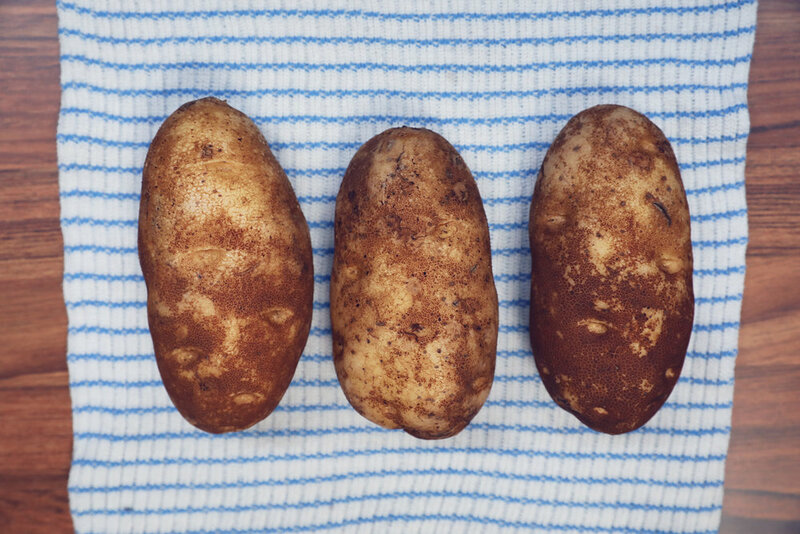 In the process of creating this recipe I've learned a lot about the nature of potatoes. My original version was a scalloped potato casserole, creamy au gratin style, with layers of tangy sauerkraut interlaced between thinly sliced potatoes. When I took it out of the oven, it looked beautiful, but unfortunately when I tried it the potatoes were rock hard and uncooked. I put it back in the oven and cooked it a while longer... and then even longer... but the potatoes refused to cook. I ended up looking online for why this might be happening and as it turns out, potatoes won't cook in acidic substances, such as the tangy sauerkraut that I love so much. I felt a little defeated and decided to let the idea sit on the backburner for awhile. Eventually, while eating my favorite cheesy potato quesadilla recipe, inspiration struck again and I realized I can use a similar creamy mashed potato filling so that it's already cooked so it can't be disturbed by a layer of sauerkraut. So I tried it out with mashed potatoes and this time it actually worked! The recipe that I had been dreaming about for months was finally a hit and I've been making it over and over again ever since. Be sure to use a high quality sauerkraut such as my all time favorite brand, Bubbies. 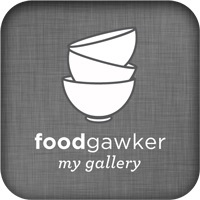 You can find the best sauerkrauts in the refrigerated section at your grocery store. Generally, the sauerkrauts that don't need to be refrigerated aren't as good as the ones that do require refrigeration. This is a great recipe to make ahead of time or even in a larger portion because it keeps well in the fridge for up to 5 days, though mine always tends to disappear very quickly. I hope you enjoy this recipe and that it becomes one of your favorites as well! I ended up using three medium-sized russet potatoes for this recipe, which made about 4 cups, but since potatoes sizes vary I'd recommend measuring out 4 cups of cubed peeled potatoes. 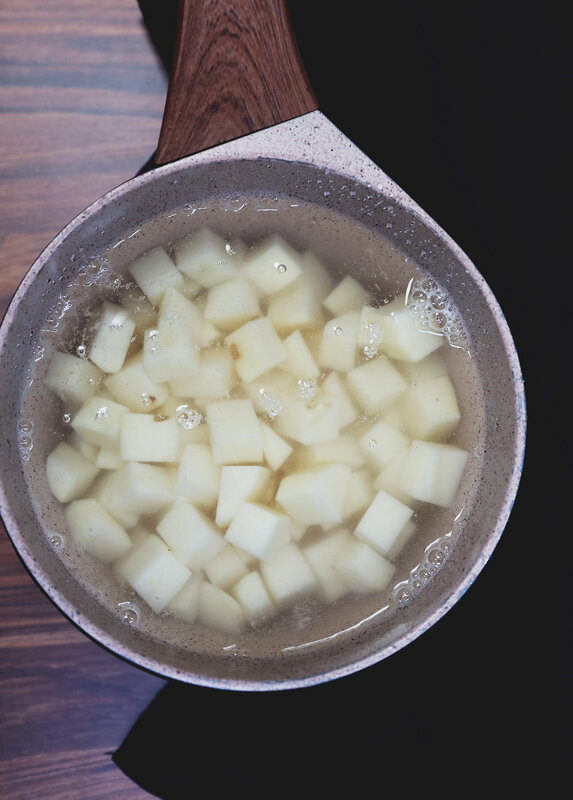 Place the potatoes in a pot and cover them with cold water until they're just submerged under the water. Place the pot over medium-high heat to bring to a boil. As soon as the potatoes start to come to a rolling boil, set a timer for 7 minutes and turn the heat down to medium. After the time has passed check to make sure the potato chunks are fork tender and then drain the water out of the pot and then return the potatoes to the same pot. Make the creamy garlic sauce in the blender either while the potatoes are boiling or right after by combining all of the sauce ingredients in the blender until smooth. 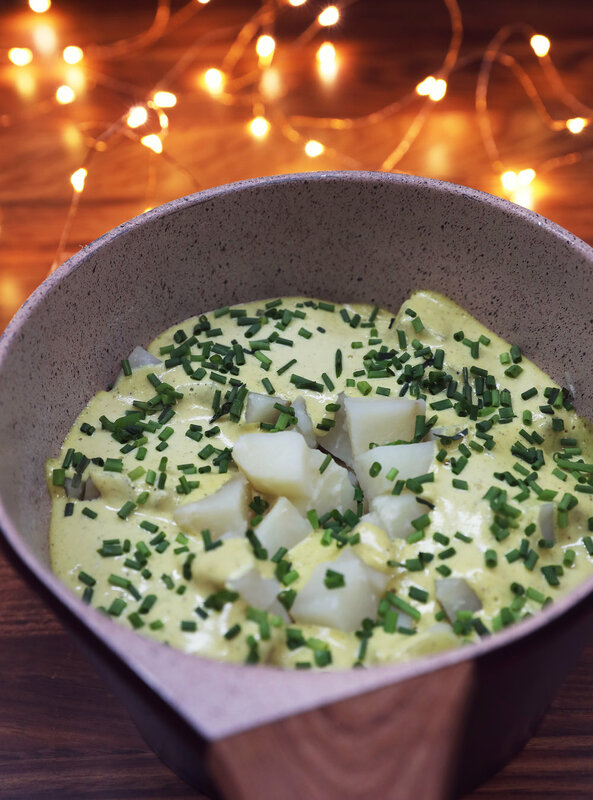 Add the creamy garlic sauce to your steamed potatoes in the pot along with some chopped chives and then mash until well combined. Assemble the casserole in your dish by starting with an even layer of sauerkraut, followed by a layer of mashed potatoes, and then quickly mix together your breadcrumbs and herbs and sprinkle them over the top. I've never had any issues with the sauerkraut sticking to the bottom of the baking pan, so I don't bother greasing the pan first. Bake in the oven for 20 minutes at 400 degrees. Remove from oven, cool for 10 minutes, and then serve.